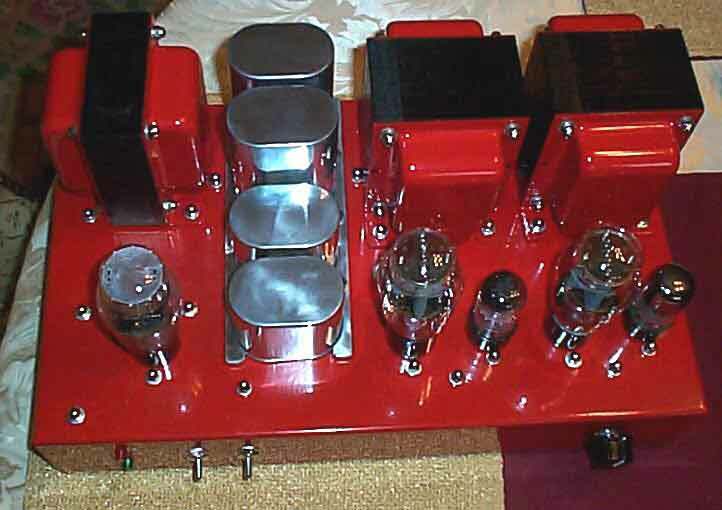 Here are some photos of the new SE 2A3 amp I built for Jim Scheffel. 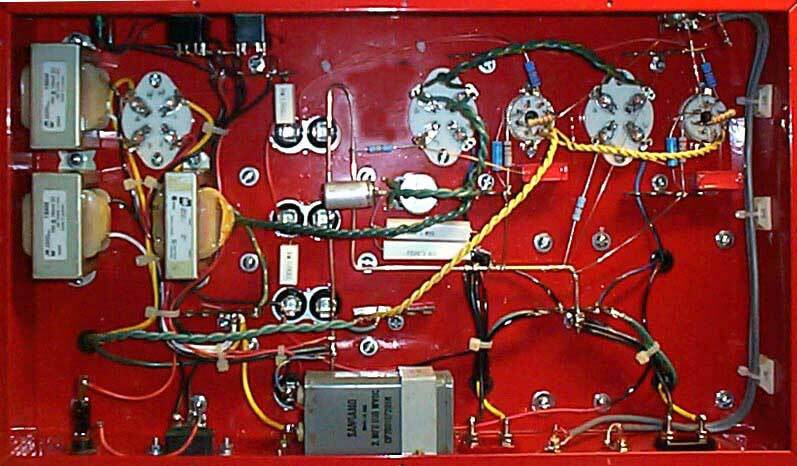 The design is adapted from the Simple 45 on Duncan Amps site. 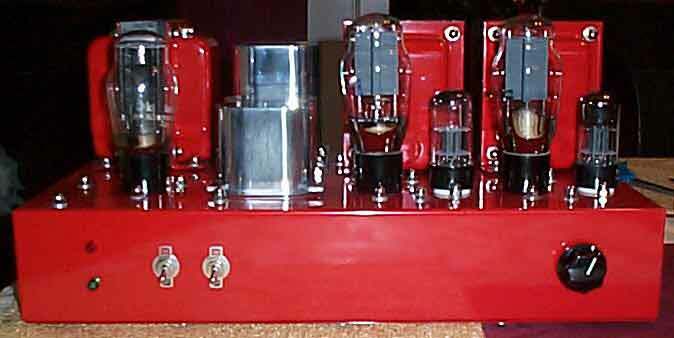 Output tubes are Sovtek 2A3s, rectifier is a NOS Mullard 5Z3 and drivers are NOS Tung-Sol 6SL7GT tall bottles. Transformers and chokes are all Hammond. Power supply capacitors are 370 VAC motor run caps and one vintage 2uF oil capacitor. The chassis (also Hammond) and transformer bells are powder coated. It's a smooth, durable finish and easy too!! Any color you want, no prep work, 2 days, $32.00; you can't beat it. I really like the overall retro-industrial look. The sound is very strong, good bass, liquid midrange, excellent for acoustic guitar and vocals. 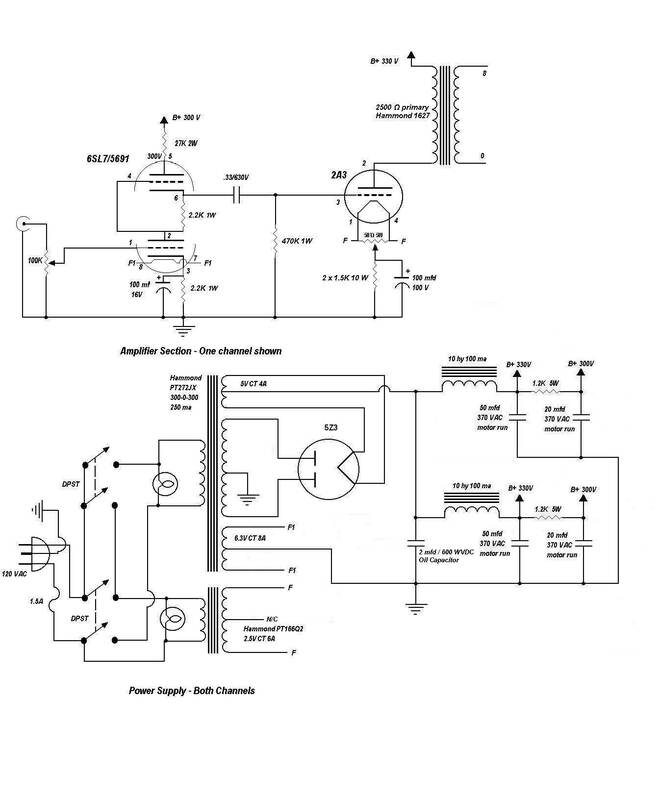 The power supply of the amp is split into two channels after the first cap (a vintage 2 uF 600 WVDC oil cap). It also has center tapped windings for the rectifier and heaters. I took the B+ from the rectifier center tap instead of one side of the cathode. and it adds 50 uF of filtering to the overall power supply, definitely an improvement. I use a bus grounding scheme using 12 guage bare copper. It works well for me and is easier than trying to star ground everything. Signal wiring (25 gauge cast copper) and copper-content solder were provided by Dennis Boyle of Chimera Labs in Dallas. Coupling caps are .33uF Wima. Excuse the crude Paint schematic. Click here to visit the rest of my site.